I love to share things with my readers that I love! 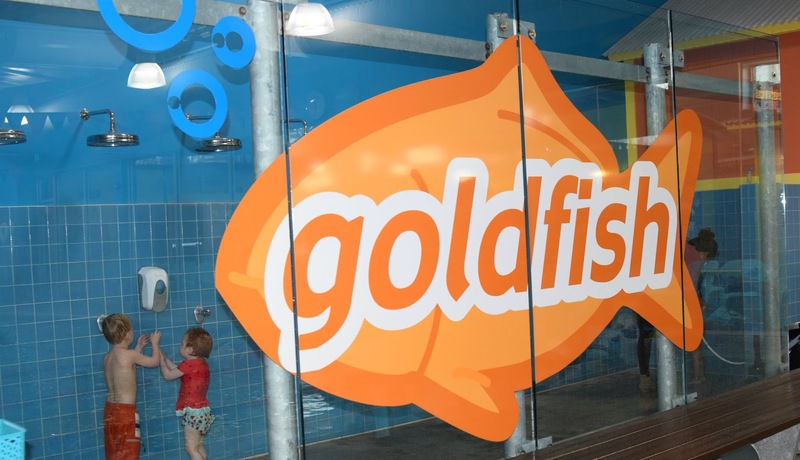 Thank you to Goldfish Swim School for sponsoring this post. While this post is sponsored, all opinions, thoughts, and content are my own. As I am tucking my son into bed he always asks in his sweet little voice, "so what are we going to do tomorrow when we wake up?" When he finds out it's a swim day at Goldfish Swim School he gets excited! I finish tucking him in and think how wonderful it is to know he enjoys his weekly lesson with Ms. Kendra. It wasn't long ago that he was taking swim lessons at another establishment and giving me a hard time. He would tell me he did not want to swim and even put up a struggle to get into the water. It wasn't that the instructor or lessons were poor, it just wasn't a good fit for my little guy. Now that we are at Goldfish, I am beyond grateful to see his love for swimming blossom. As parents we are always reflecting and thinking about the choices we make for our children. When I stop to think why my children love Goldfish, these reasons began to flow. As an educator I understand the importance of praise and encouragement. At Goldfish Swim School the swim instructors put a lot of energy in continuously praising our little fish. I see a ton of high fives and positive reinforcement. At the end of each lesson, each swimmer receives a ribbon for their efforts and it always makes learning to swim rewarding! . Kids love to have fun! 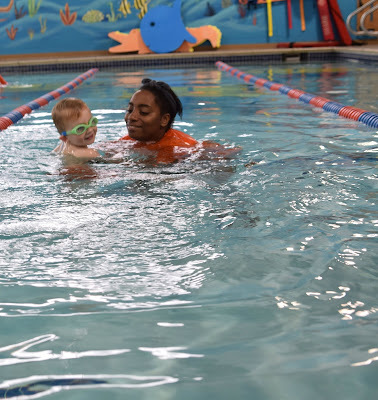 The instructors at Goldfish are always demonstrating their enthusiasm for learning to swim and it's contagious! Even I get excited! While sitting pool side and watching a lesson I am impressed at the way the instructors ensure they make eye contact with our little swimmers throughout the lesson. This makes our little fish feel valued and also it is very important for water safety. The minute you walk into the door you are welcomed by the child friendly atmosphere. You never have to worry about interrupting an adult's swim because Goldfish is simply for kids 12 and under. The dressing rooms are fun colored, the showers are conveniently located by the pool, and the hair drying area is surfing in style. Who likes swimming in a cold pool? Not us! Possibly the best feature about Goldfish is the 90 degree pool! No more shivering after a 20 minute swim lesson. I give that a thumbs up! It takes my two year old time to warm up to new faces. As you can imagine her first few lessons began with a heavy cry but I was reassured that she was in good hands as I witnessed the instructor show love and compassion to my daughter which quickly built her trust and now tears are in the past. I also love seeing her excitement about swim class. My little Goldfish makes me proud! Nothing bums me out more than missing a swim lesson but Goldfish Swim School understands that sometimes kids get sick or we simply can't make our scheduled time. When this happens, we can schedule a make up session. As a parent who values these lessons, it is wonderful to know we can make up our missed classes. Can you tell I am a Goldfish Swim School fan! You can be too! Be sure to follow Goldfish on Facebook and Instagram. Curious...what do you look for when choosing swim lessons for your child? Have you been a Goldfish? Is so, what do you love most about Goldfish? It's great because now he loves swim class! It's so nice not having to beg him to participate. Swim lessons for littles are so crucial, so it's great that you were finally able to find a place that he is comfortable with! So important for little ones to learn how to swim at an early age. This looks like a great swim class. 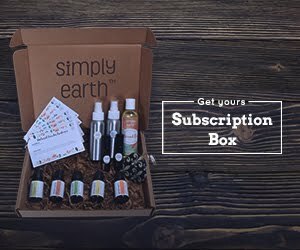 This is awesome that you found a great fit for your guys! So jealous over the heated pool. We live in Alaska and the pool is freezing here, so we don't go during the winter. I can imagine. Michigan gets cold too but nothing like Alaska. How cute! I love that they have warm pools too, especially because my kid loves being able to swim all year round! My kids go to Goldfish Swim School too! They love it!